Convection occurs when heat is transferred through a gas or liquid by the hotter material moving into a cooler area. In meteorology, it is the transfer of heat and other atmospheric properties by the movement of masses of air, particularly in an upward direction. In geology, it is the slow movement of material below the Earth's crust. Boiling water - The heat passes from the burner into the pot, heating the water at the bottom. Then, this hot water rises and cooler water moves down to replace it, causing a circular motion. Radiator - Puts warm air out at the top and draws in cooler air at the bottom. Steaming cup of hot tea - The steam is showing heat being transfered into the air. Ice melting - Heat moves to the ice from the air. This causes the melting from a solid to liquid. 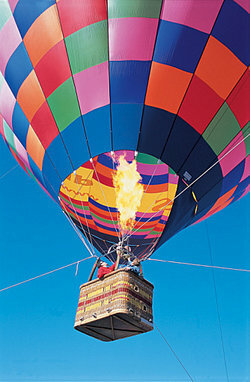 Hot air balloon - A heater inside the balloon heats the air and so the air moves upward. This causes the balloon to rise because the hot air gets trapped inside. When the pilot want to descend, he releases some of the hot air and cool air takes it place, causing the balloon to lower. Frozen material thawing - Frozen food thaws more quickly under cold running water that if it is placed in water. The action of the running water transfers heat into the food faster. Mantle convection - The rocky mantle of the Earth moves slowly because of the convection currents that transfer heat from the interior of the Earth up to the surface. This is the reason the tectonic plates move gradually around the Earth. Hot material is added at the growing edges of a plate and then it cools. At the consumption edges, material becomes dense by contracting from the heat and sinks into the Earth at an ocean trench. This triggers the formation of volcanoes. Oceanic circulation - Warm water around the equator circulates towards the poles and the cooler water at the poles moves towards the equator. The stack effect - Also referred to as the chimney effect, this is the movement of air in and out of buildings, flues or other objects because of buoyancy. In this case, buoyancy refers to the different densities in the air between air inside and the air outside. The buoyancy force increases due to the greater height of the structure and a greater difference between heat level of the inside and outside air. Convection of a star - A star has a convection zone where energy is moved by convection. Outside the core is a radiation zone where plasma moves. A convection current forms when the plasma rises and the cooled plasma descends. Gravitational convection - This shows when dry salt diffuses downward into wet soil because fresh water is buoyant in salt water. Forced convection - This is where a fan, pump or suction device is used to facilitate convection. These different examples of convection show how convection occurs throughout many different man-made and natural occurances. "Examples of Convection." YourDictionary, n.d. Web. 23 April 2019. <https://examples.yourdictionary.com/examples-of-convection.html>. Convection occurs when heat is transferred through a gas or liquid by the hotter material moving into a cooler area.In meteorology, it is the transfer of heat and other atmospheric properties by the movement of masses of air, particularly in an upward direction.In geology, it is the slow movement of material below the Earth’s crust.